My first post celebrates the completion of a renovation I’ve been working on over the past year in Slingerlands, New York. I have been working closely with my client to develop a design for their nineteenth century Victorian house. The program included multiple iterations of ideas and drawings to develop the following programmatic needs for their busy family of four. I designed the space with the detailed input of the family members. We managed to consolidate their books, board games, music and art in the custom millwork that surrounding the family room. The client’s concern for environmental sustainability is reflected in the reuse of the existing kitchen cabinets. The project consists of a number of elements designed to meet the needs. 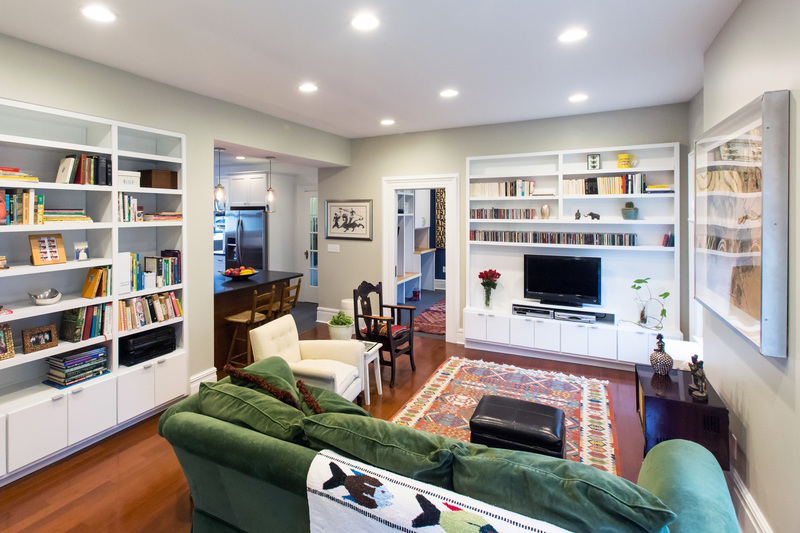 The first goal was to connect the kitchen with the family room by removing an existing load-bearing wall. In order to accomplish this we reconfigured the existing kitchen and relocated the first floor powder room originally in the family room. Secondly, we created a new entry into the back of the house as well as a new mudroom and small home office space. Finally, we reconfigured the second floor master bathroom to accommodate a washer and dryer that were originally located on the first floor near the kitchen. Load Bearing Wall: In order to remove the load bearing wall there were a few things we had to do in order to make sure the load was distributed properly. First, we had to put in a two LVL beams with a post on either side of the opening. Simultaneously, there had to be two posts added in the basement to account for the additional weight distribution. Here is a photo of the walls opened up. The demolition has begun. The beams are in place. The floors stripped. The cabinets removed and stored for future use. Here is a photo that captures how things were coming together. Millwork is not in yet, but you can get a sense of where it going as the niches are there. Completed. Mill-work is in place, floors are in, lights are shining (BTW these are amazing LED lights that are on dimmers), everything is painted and the house smells freshly renovated. Wow! I didn’t think a load bearing wall could be removed. The finished space looks lovely. Are the process pictures taken from the same angle as the first one? 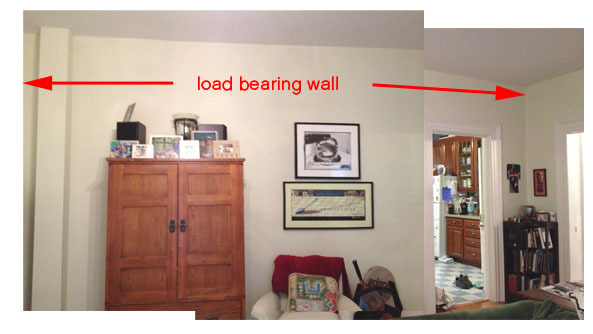 Where was the load bearing wall originally in the final picture? A load bearing wall can only be removed if proper calculations are made to account for the weight being distributed. There were two beams that were installed to account for weight distribution of the load. In addition, we added two extra steel posts in the basement, right below this floor, to equally distribute the weight. 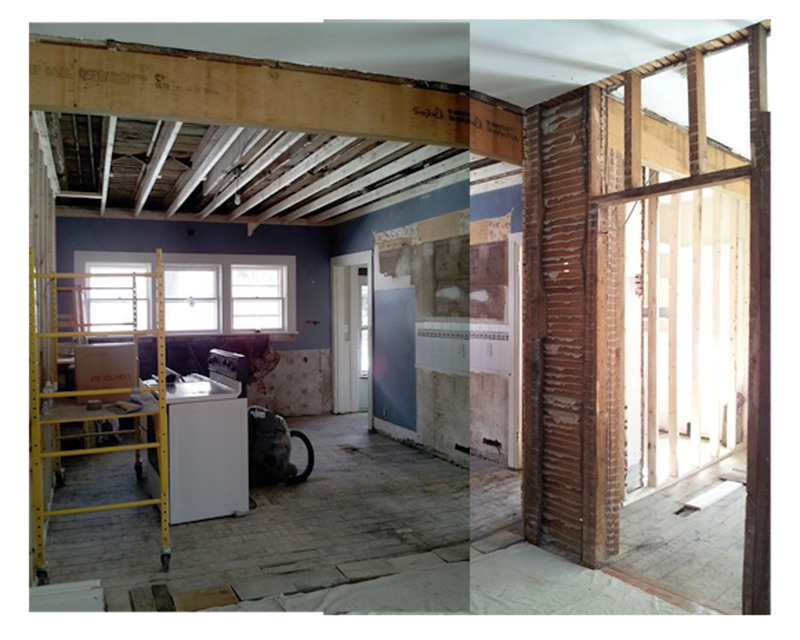 The portion of the load bearing wall that was removed spans the entire opening to the kitchen from the family room. This is how we made room to add the island and account for adequate space for circulation between the family room and the kitchen. It is approximately 11′-0″. The first photo is more or less in the same spot as the last one.